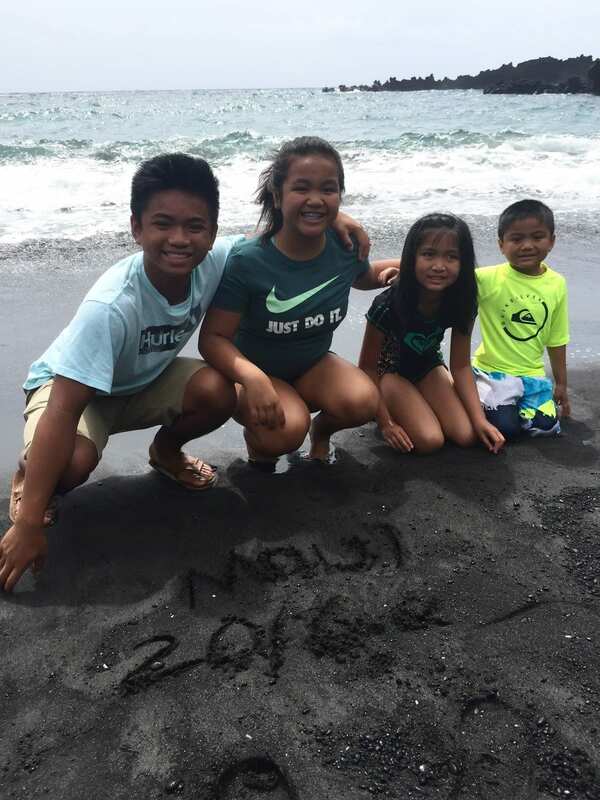 On our way to Maui, we talked about when we’d go back to Hana. Most of you know that going to Hana (as in driving all the way through) is quite time consuming. 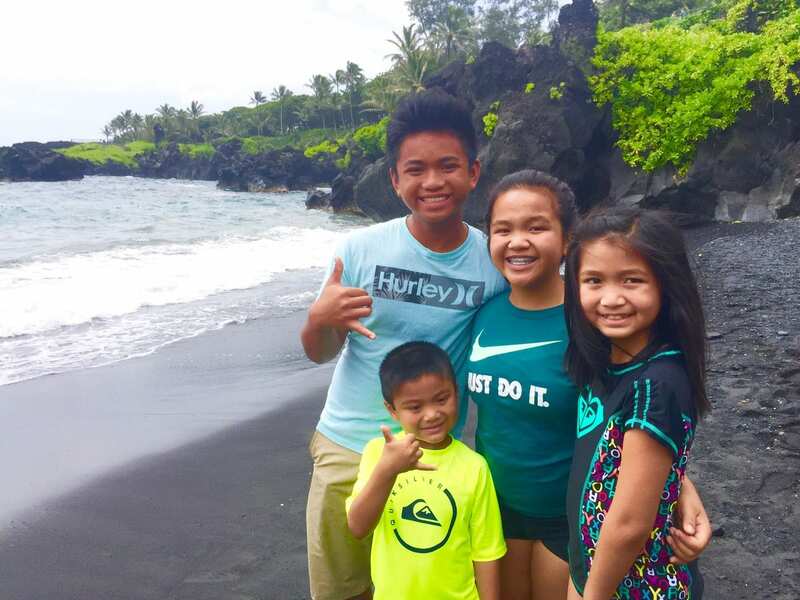 Back in 2014, we started out very late when we made our way to Hana. 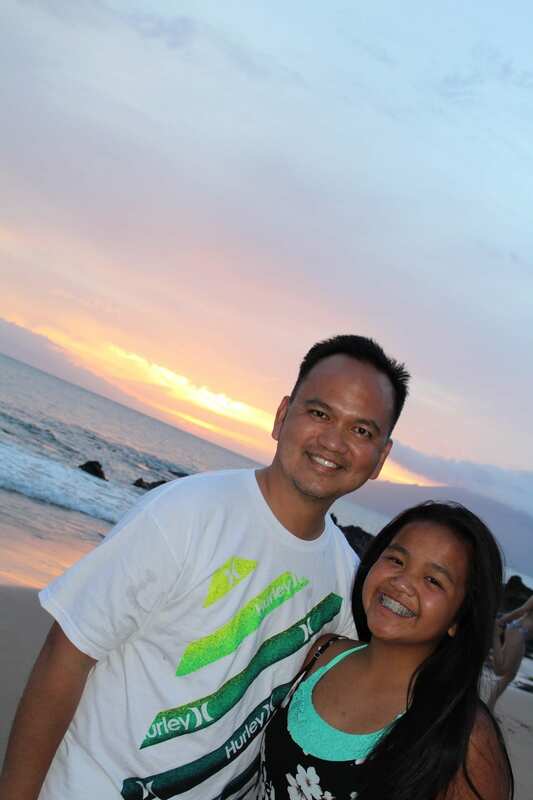 Back then, we left Kahului around 11am. 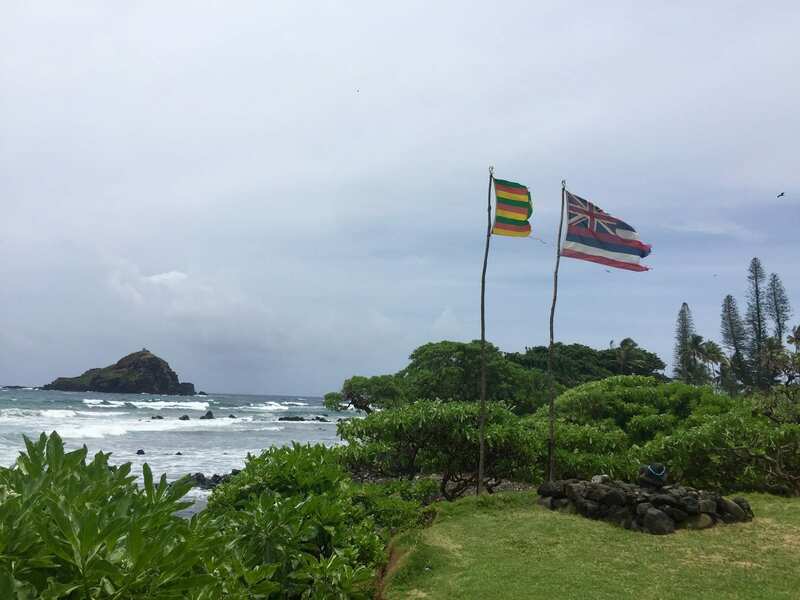 Since it was our first time, we stopped at various tourist traps, took lots of pics, and didn’t get to Hana until 4pm. By the time we made it to Oheo Gulch it was already past 5pm. Not this time. We made sure to do everything right this time around. On Friday morning, since we all had a good night’s rest (heck we all slept between 4:30pm and 6pm), Nancy and I got up at 4am and got ready. I cooked a hearty breakfast – spam, bacon, and eggs, while Nancy did what she does best – prepare for the day. By 5am local time, we woke up the kids, their breakfast was ready. Looking back, I don’t regret all of us getting knocked out so early the night before. 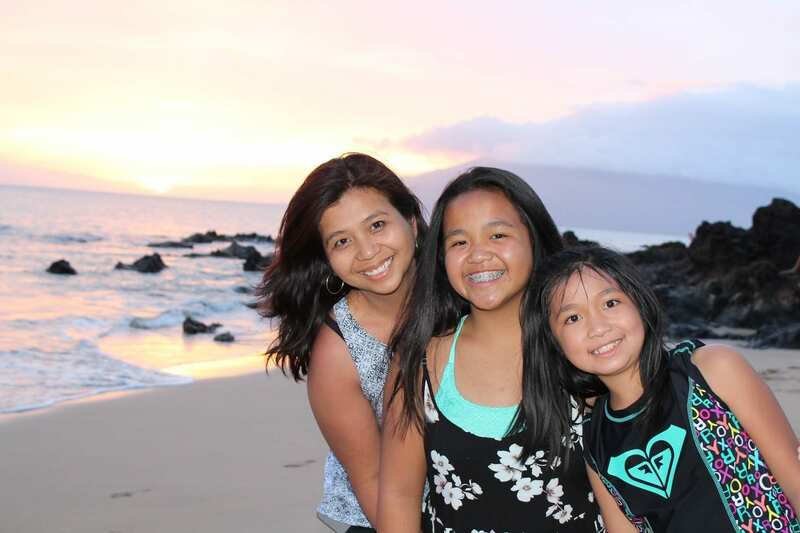 We needed to wake up early to prepare for Hana, so sleeping early on Thursday night was a blessing in disguise. Our goal was to leave the condo at 6am. We were finally all in our SUV by 6:15am. Hey, that’s not bad at all. With 4 kids in tow, I thought they all deserved a prize for being ready that early while on vacation. 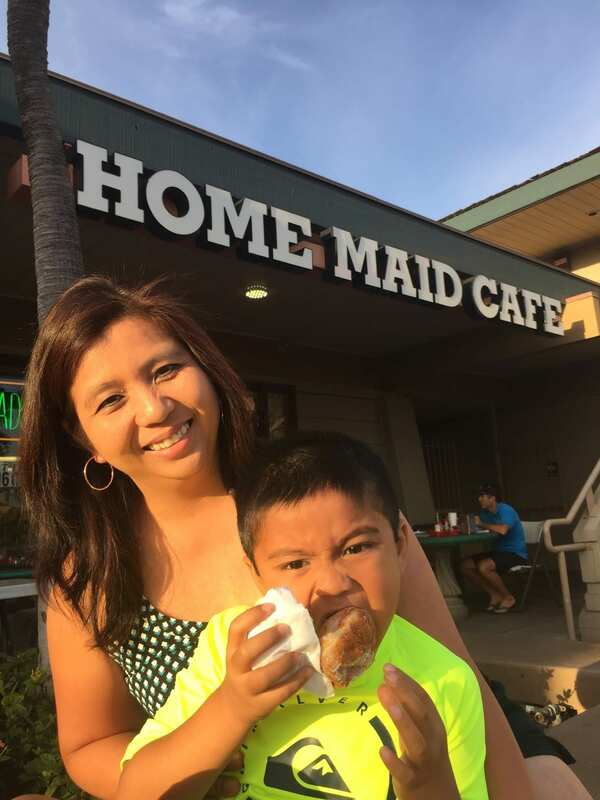 Before we drove to Hana, we made a couple of quick stops – Home Made Cafe in Kihei for Evan’s Hawaii fix – Malasadas. 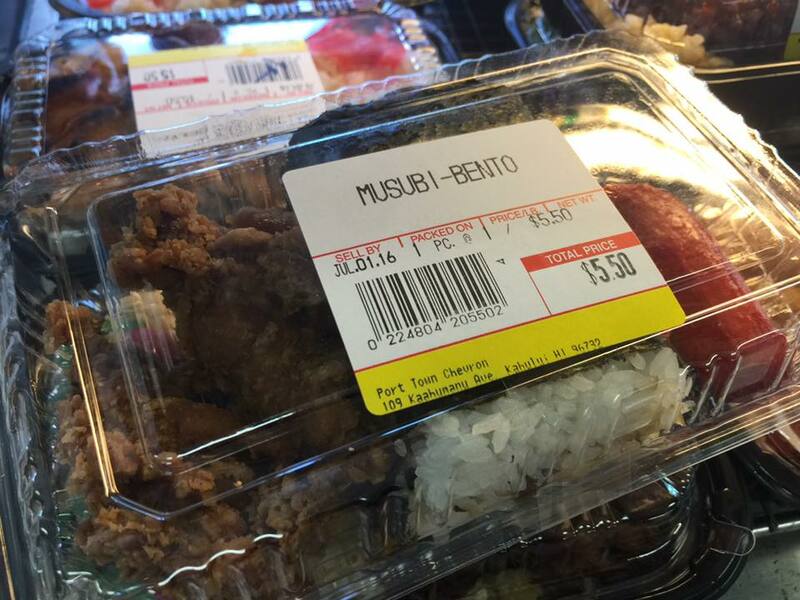 We also planned on stopping at Port Town Chevron in Kahului (not only to get gasoline, but to check out their pre-packed hot lunch/bento boxes). Home Maid Cafe was already bustling with customers by the time we got there. We ordered a half dozen sugar malasadas. 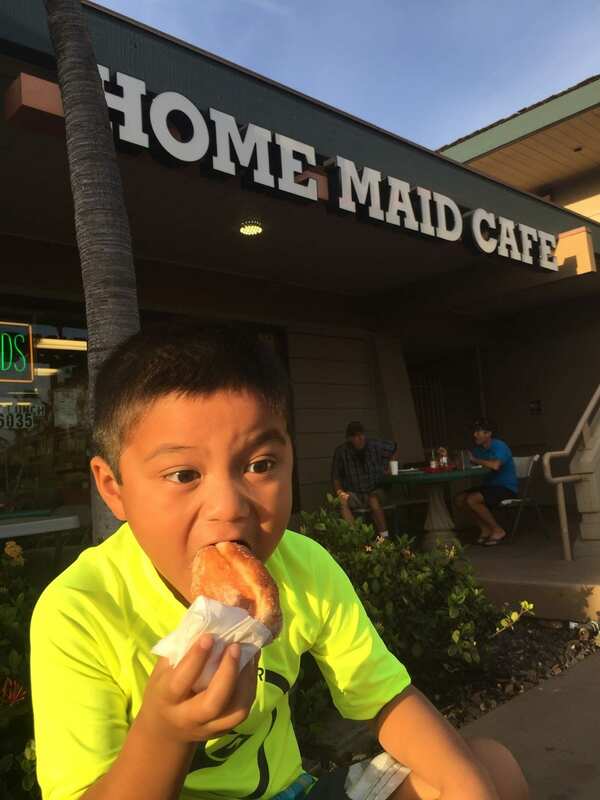 After a few minutes, we started to eat the malasadas. Nancy preferred this than Sugar Beach’s malasada. Maybe it’s because she got to eat them while it was hot and fresh, unlike the day before, the batch that she got from Sugar Beach had already cooled down by the time we got to the condo. 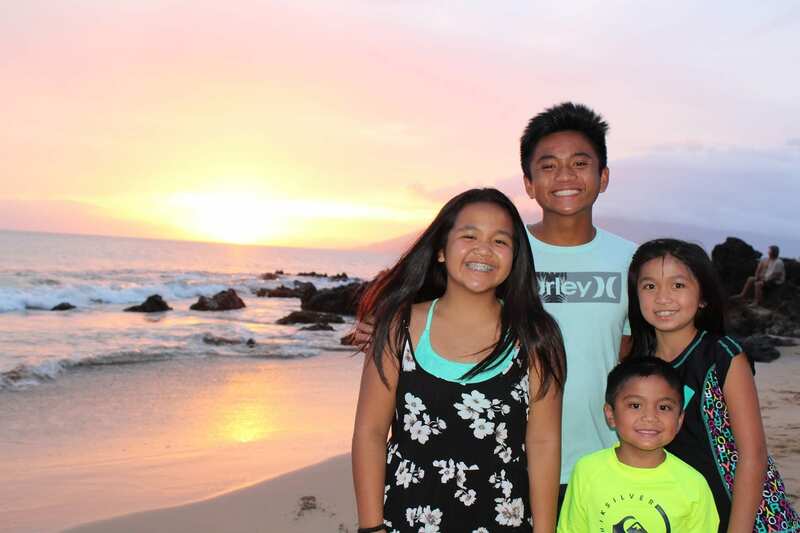 We made our way to Kahului to fill up our not-so empty tank. I didn’t want to take the risk of not having gasoline in Hana…you just never know. 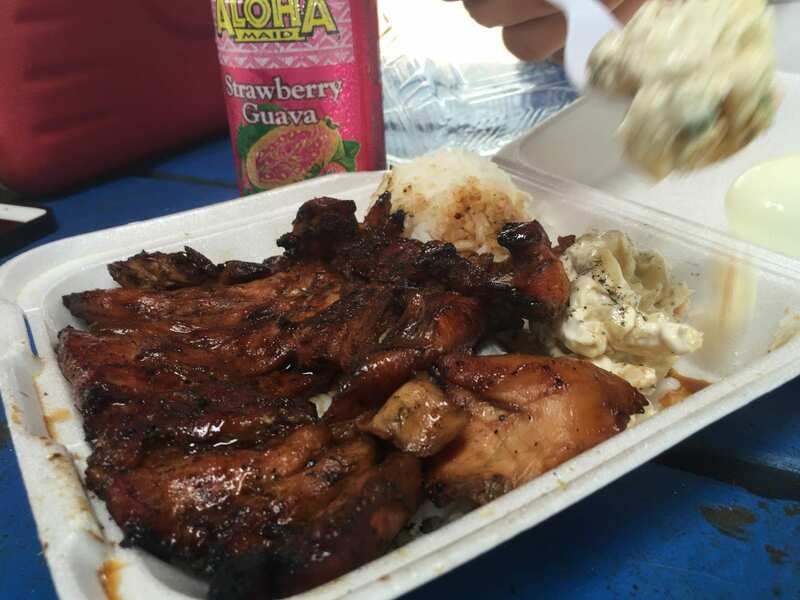 So I looked at my list, and I remember Kathryn from Tripadvisor (TA) indicated that the Port Town Chevron in Kahului is a good place to stop for good early morning lunch boxes prior to going to Hana. Kathryn’s suggestions have never failed me, and she did it again. First of all, Chevron? A gas station? Well, yes. 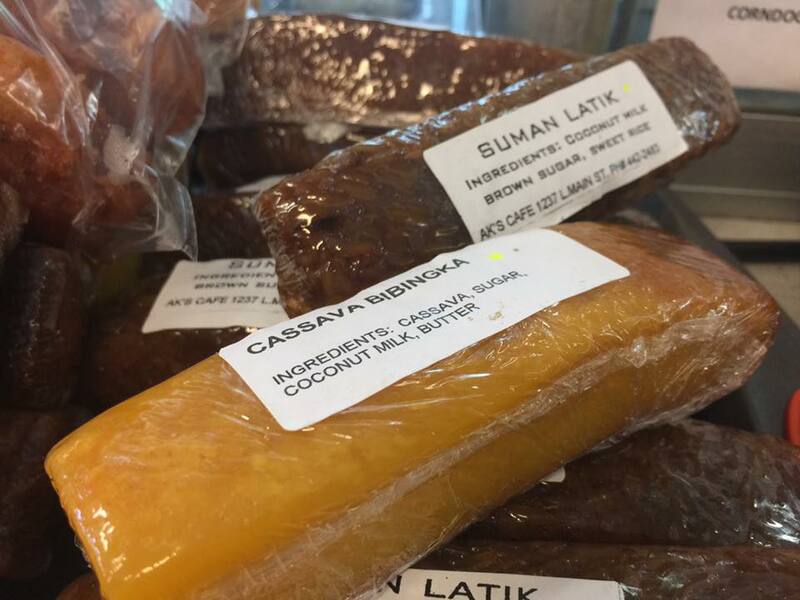 It’s not your typical convenience store items. 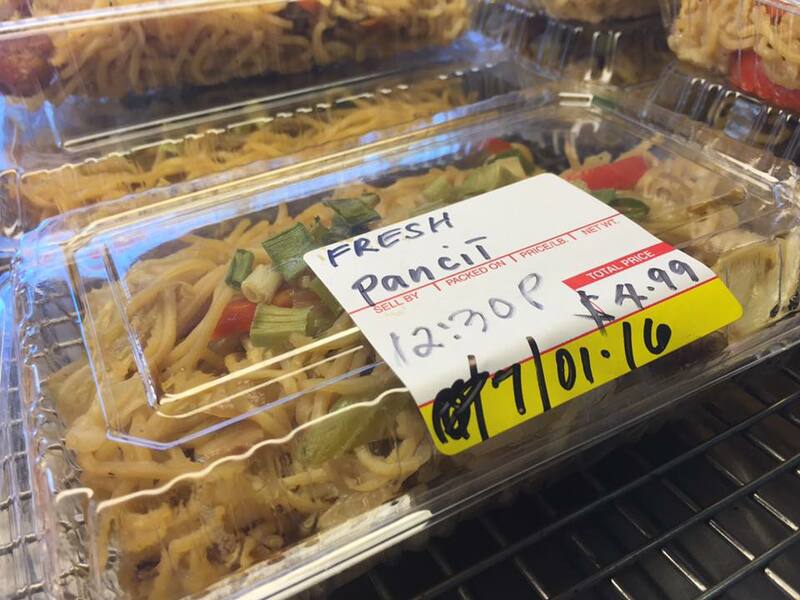 Once I entered, I saw the bento boxes – there”s pancit, longanisa….hmmmm, I think this place is ran by Filipinos, no? Of course! 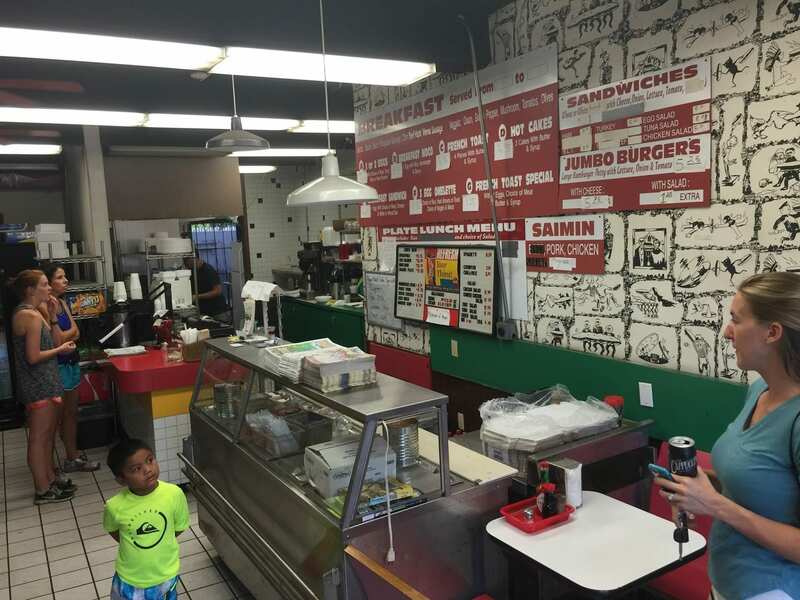 They had a great selection of quick lunch and breakfast items. 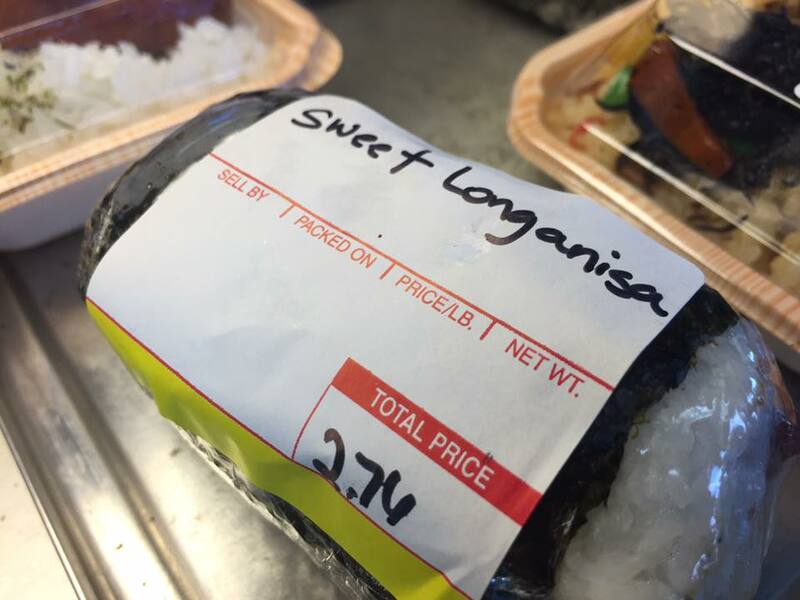 Since we had already packed our own lunch, I opted to try their Spam Musubi Bento Box (with chicken and hotdog), and I sampled a couple Filipino deserts – Suman Latik and Cassava Bibingka. Finally, it was time to hit the road. We were on our way to Hana by 7:15am. Again….wow! I’m still surprised that we were doing so well with our time. What’s the plan? 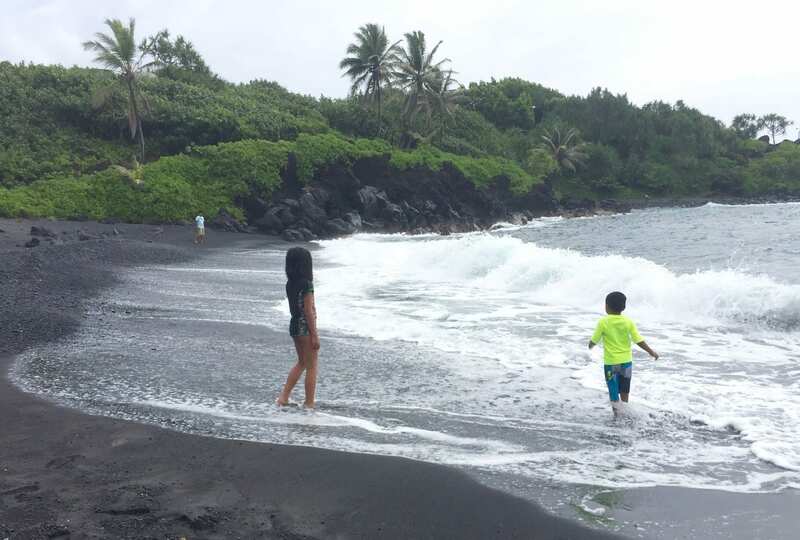 Drive all the way to Hana….and NOT stop at the tourist traps – we’ve been there before and we just want to spend more time in Hana. As you can imagine, it was close to 2 hours of just driving around the 600 curves and turns and crossing 50 bridges. That’s Hana! We were so disciplined. 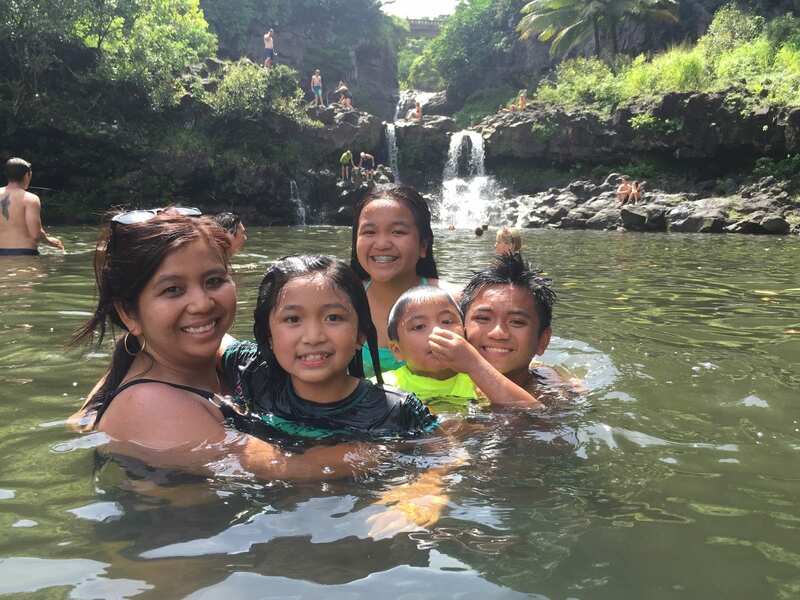 There were a couple stops with lots of early morning tourists gawking at the beautiful waterfalls, but we kept on with our journey to Hana. By 10:30am, we decided to leave the park. We didn’t go to the caves anymore – we were there last time, and we jumped in the ice cold water….we just wanted to keep on moving. 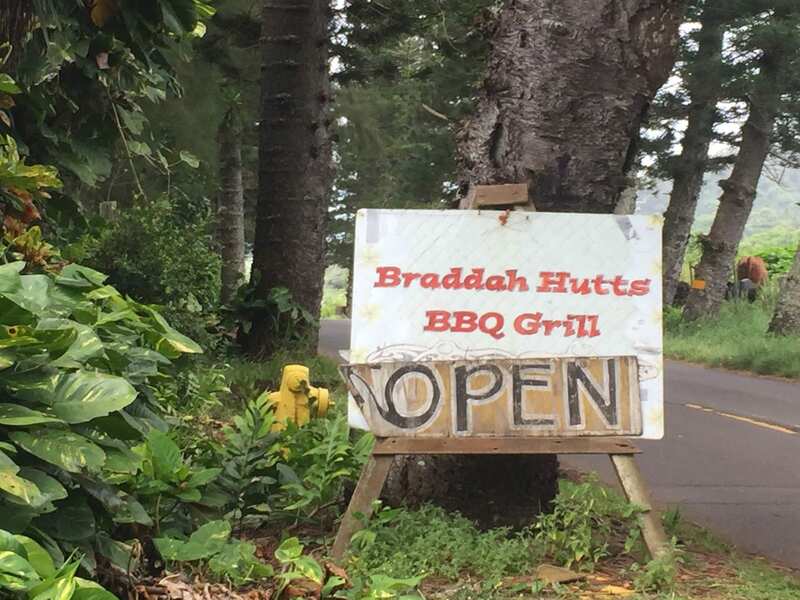 We did see Braddah Huts (famous for their BBQ), but it was still too early to have lunch. 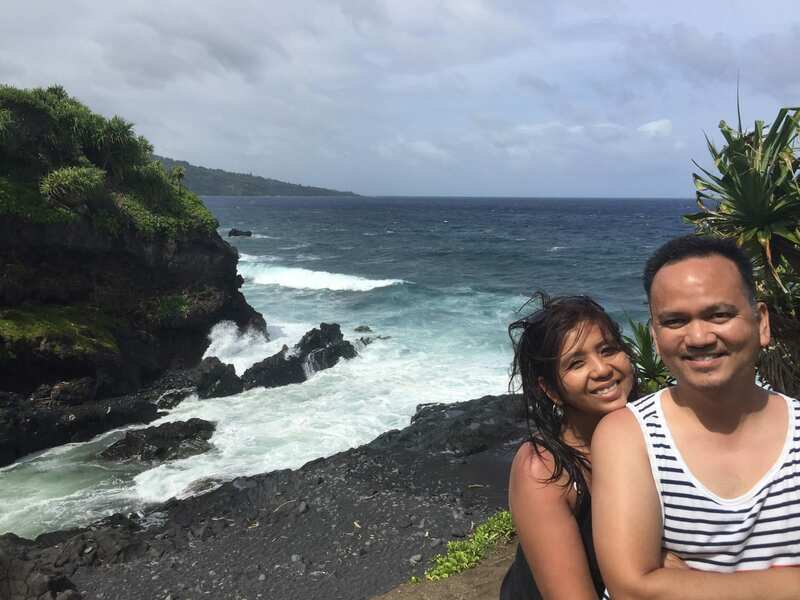 We kept on driving, and I saw a sign to Koki Beach and Hamoa Beach. I have no agenda or itinerary as you can see. So I turned left and followed the road. 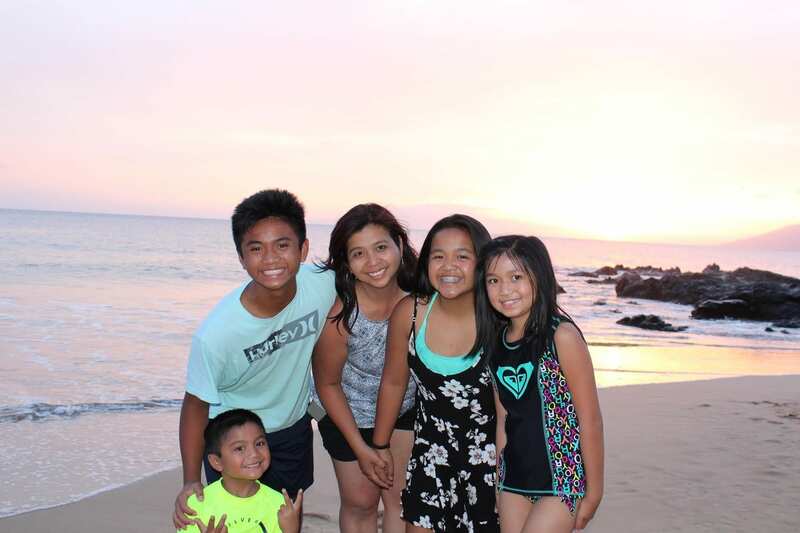 I’ve never been here in the 4 times I’ve been to Maui. 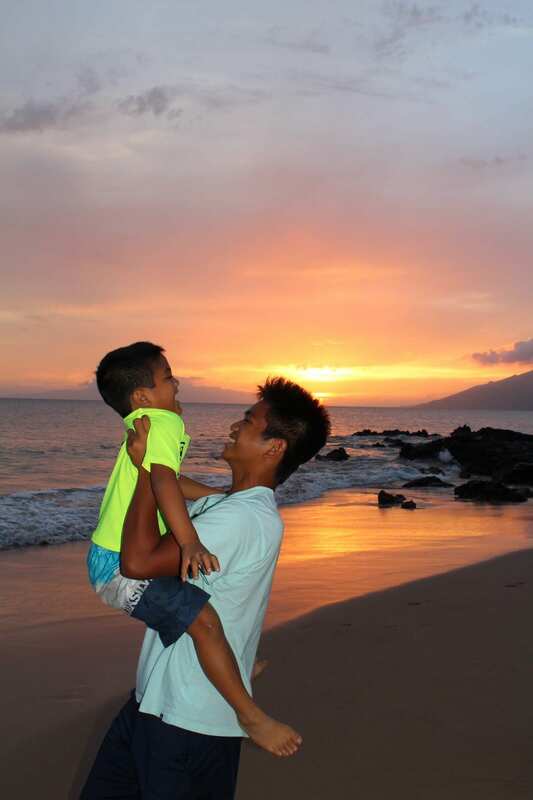 First it was Koki Beach….the waves were crashing. It was gorgeous. 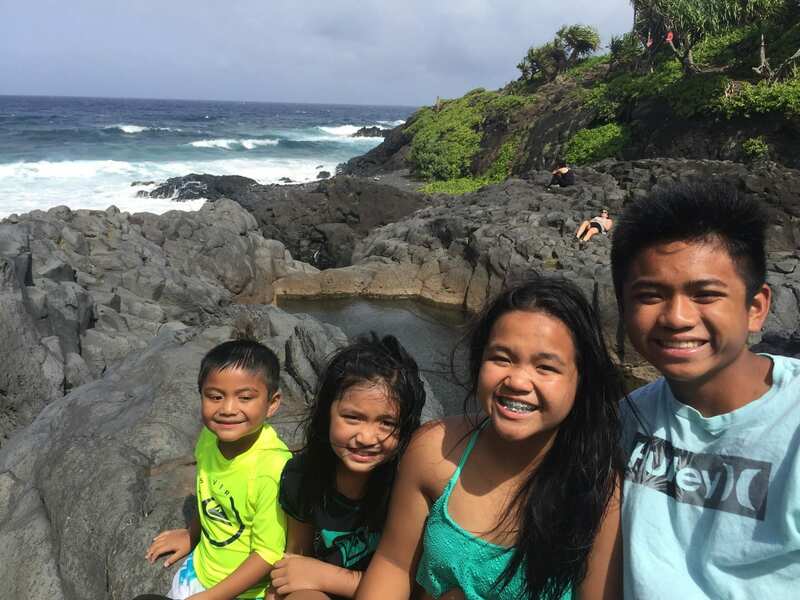 We didn’t stop there, we went to Hamoa Beach instead and that’s where the kids swam. 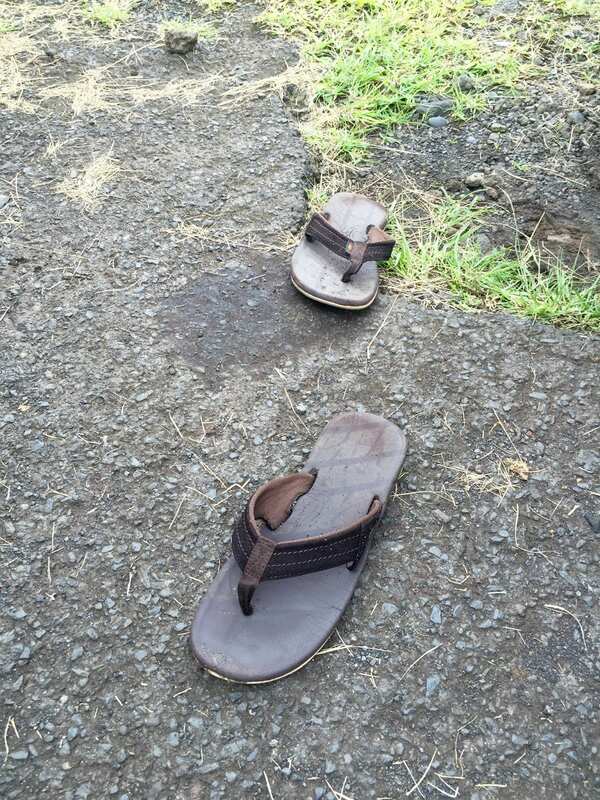 Upon getting to Hamoa, when I was about to step out of the SUV, I realized that my Rainbow Sandals were missing. Well, duh!!! 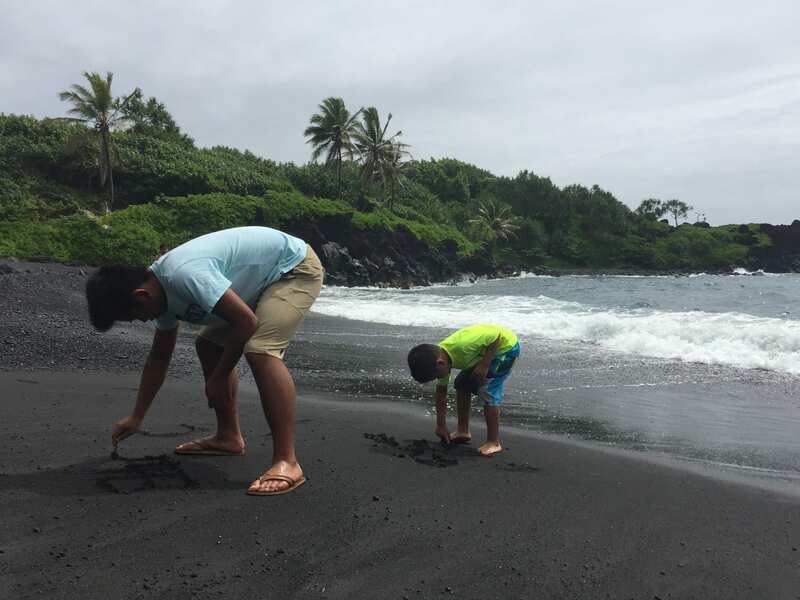 I took them off at Waipanapapa State Park when I brushed the sand off my feet before entering the vehicle. Ugggghhhhh!!! Fail #1. “Move on, Jason. 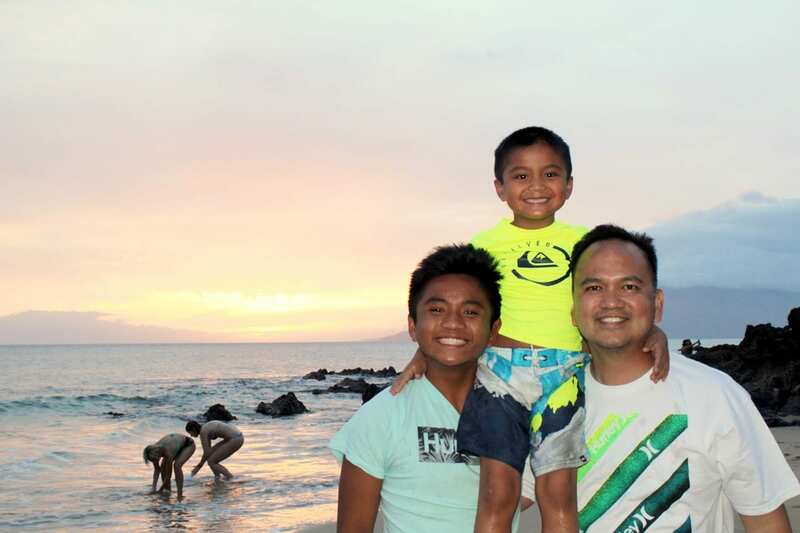 Move on.” I decided to divert my attention to the kids and the beach. I grabbed my Canon camera and started to take pictures, but camera was not clicking. I turned it on (it was on). Well, duh!!!! The battery wasn’t there! I remember charging it last night, I swear, I grabbed the battery but I don’t remember ever putting the battery in the camera. Fail #2. After a couple of whining to myself and poor Nancy, I told her that I’ll go back to Wainapanapa (about a 20 minute drive), and hope that my Rainbow’s were still there. They’re not the cheapest type of flip flops. So anyone with an eye for flip flops know that they’re Rainbow’s. They’re known to last long. I still have my first pair that I bought in 2008. I’ve worn those sandals to many trips to Oahu, Kauai, Maui, New York, and just about everywhere I went. The one that I left behind were actually quite new, just got them last April. I was determined to find them. I drove back to Wainapanapa State Park, it was the longest 20-minute drive. It’s funny because I’ve never driven “back” that way before, I’ve always driven forward. I was looking for landmarks to make sure I was going the right way. Finally, I got to the state park, and when I approached the parking lot, I found m Rainbow sandals just sitting right there in between 2 vehicles. Yay me! I texted Nancy a picture of the sandals and let her know that I was on my way back. 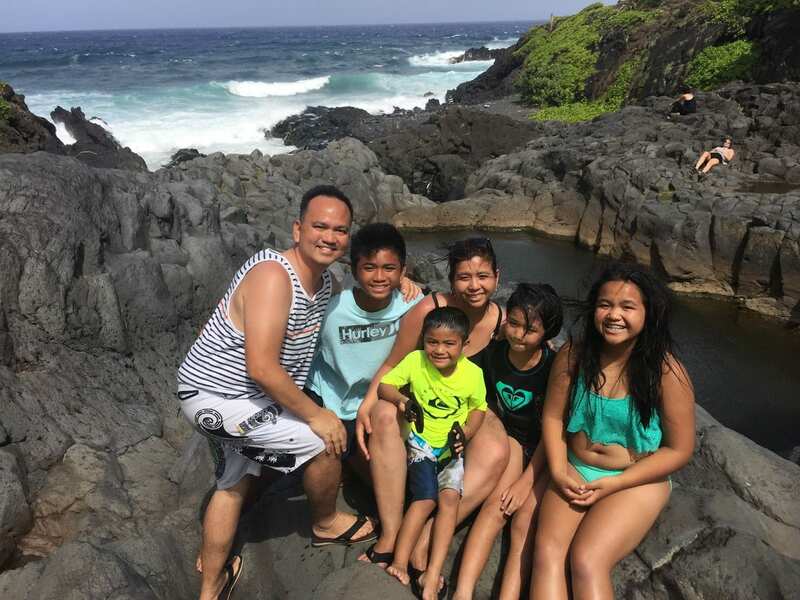 She and the kids finished their swim in Hamoa Beach, and we ventured back to Braddah Hutts for their BBQ ribs and BBQ Chicken. 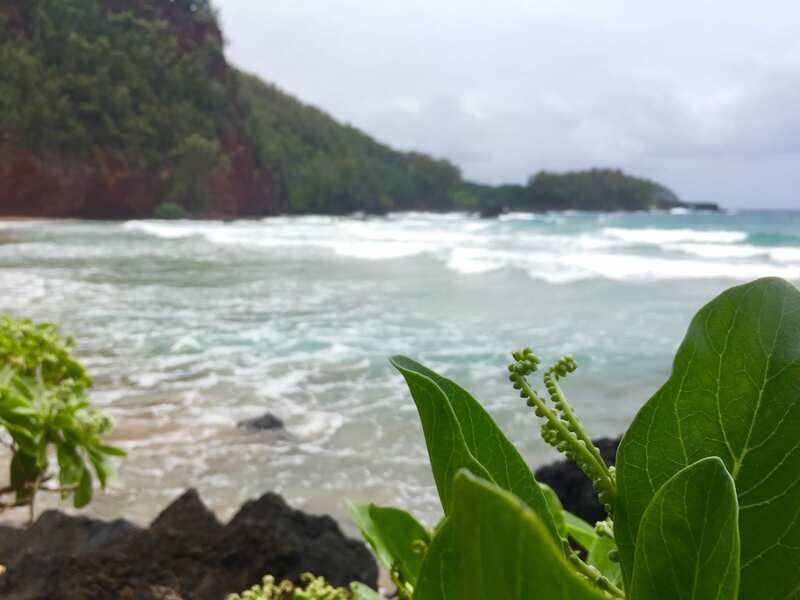 Instead of eating at Braddah Hutts (we remember lots of flies tend circle around the area), we decided to eat our lunch picnic style at Koki Beach, arguably one of the best picturesque picnic areas on the island. We ate to our heart’s content and rested for a bit. We then we headed off to Oheo Gulch around 1:30pm. 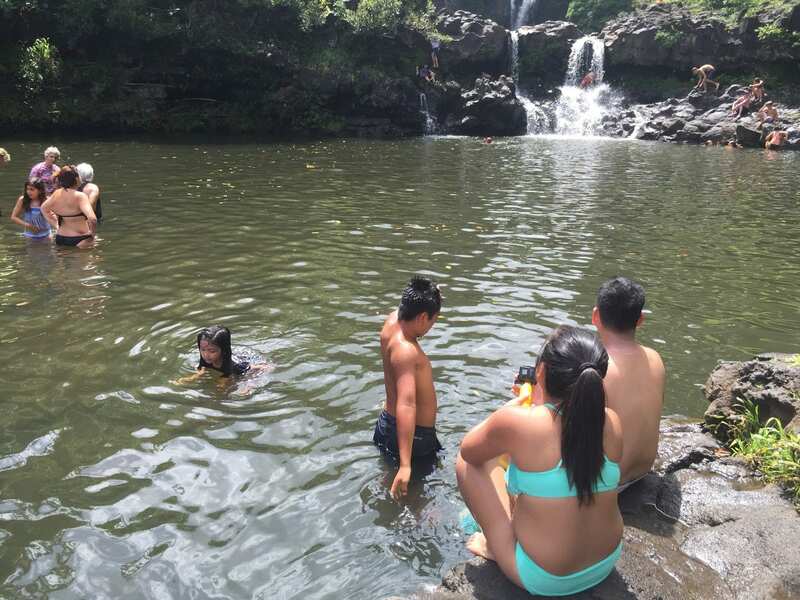 A few weeks ago, we thought of hiking down the trail but we decided to just stay at Oheo Gulch and play and swim in the water. It was a perfect way to end our busy day of driving towards Hana. Again, we were doing so well with time. It was at 3pm when we decided to leave Oheo Gulch and make our way back to Kahului. Two years ago, we left Oheo Gulch past 6pm, and we were oh soooo tired from the drive and it started to get dark when we ventured back home. Well, we learned from that experience. We were way ahead of our schedule. It was still bright out…the sun was shining, I can feel the heat beating on my left shoulder even with the windows up and the AC on blast. It took over 1.5 hours before we made it to the city. Lots of interesting conversation from the kids, secrets they know about each other, our future vacation plans, and the upcoming school year, etc. We went to Costco to fill up our gas tank again, picked up a few other necessities and headed back to Kihei. 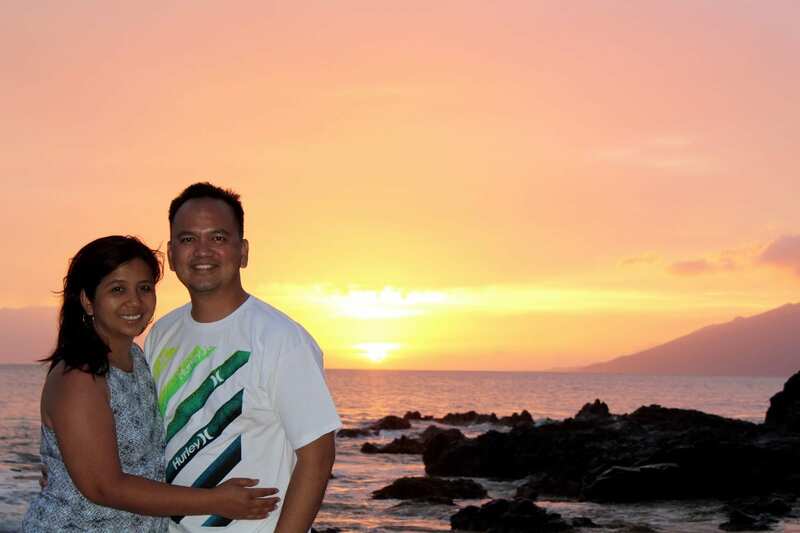 We made it to the Kihei area by 6:30pm – just before sunset. 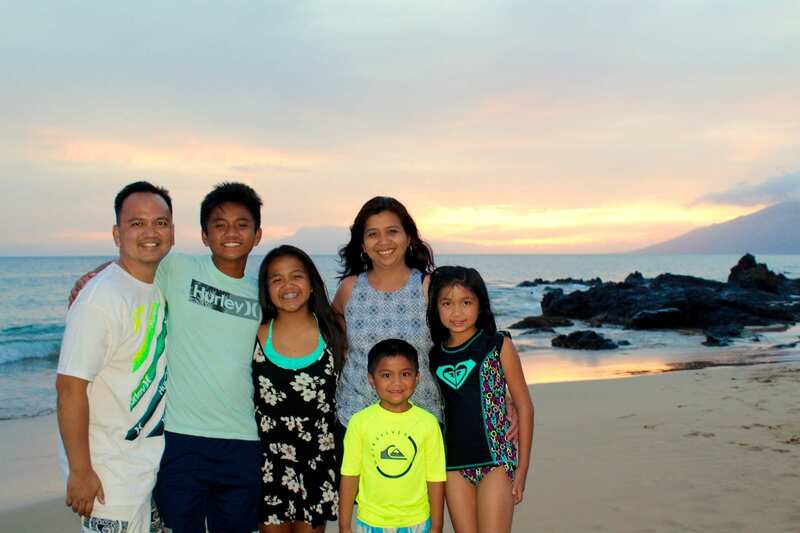 Although we weren’t all dressed up, we decided to take pictures of the family against the sunset. There were lots of people outside as well admiring the sunset. After a few snaps, Evan and Caitlin couldn’t resist – they ran to the water and swam for a little bit. We made it to our condo before 8pm. We had dinner and lounged for the rest of the evening. 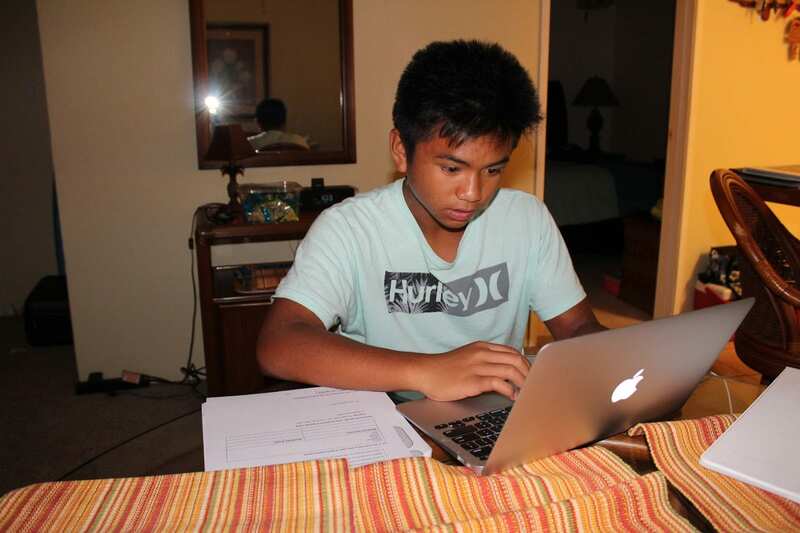 Ethan was studying online, he had to take a Spanish class this summer online, and what better way to do it that being on Maui. 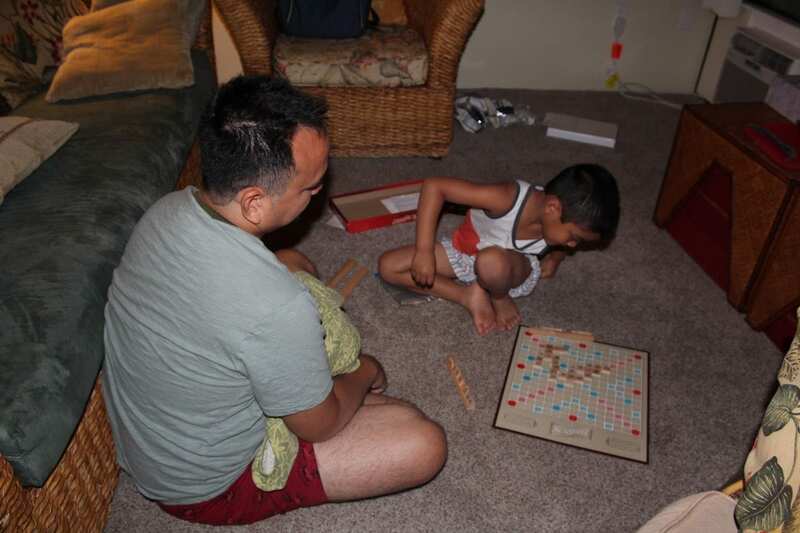 Evan and I played scrabble (shhhhh I didn’t keep score)…..that was our busy day…..can’t wait what “To Maui” brings.